Stacy McDaniel, DPT, MOT, MTC. 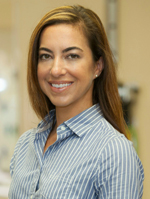 Stacey is a Doctor of Physical Therapy, Master’s Occupational Therapy and Manual Therapy Certified graduating from University of St. Augustine for Health Sciences. She is born and raised in Daytona Beach. Dr. McDaniel is passionate about health and wellness. On a personal level, she enjoys yoga, running, water sports, such as surfing and stand up paddle boarding, and has developed a recent interest martial arts.